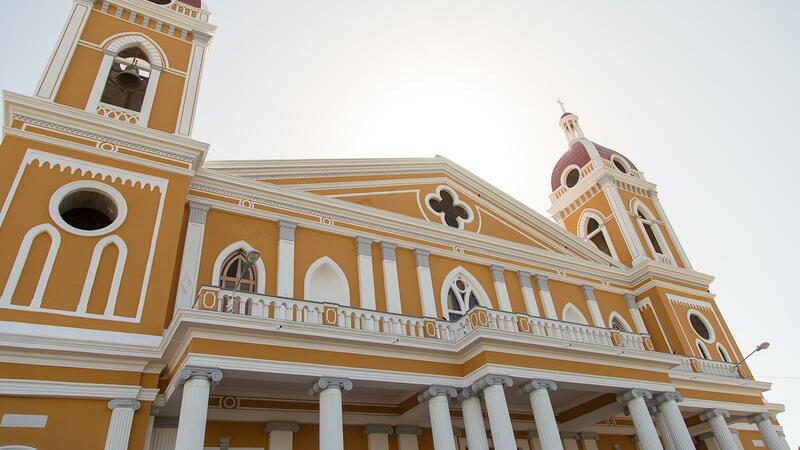 The neoclassical architecture of the Our Lady of the Assumption Cathedral in Granada, Nicaragua, is one of city's major tourist attractions. It's been nearly three months since I returned from Nicaragua's sixth Puro Sabor cigar festival, but I just can't seem to get the Central American country off my mind. Maybe it's because the weather in New York City is finally starting to turn a bit warmer. Or perhaps it's nice to daydream about lush, flora-covered mountains surrounding fields of tobacco while riding a cramped subway. Regardless, little hints of The Land of Lakes and Volcanoes keep appearing since I've been back: a pop of canary yellow here, a streak of lime-green there that are the same color of the vibrant buildings seen throughout Nicaragua; a side of rice and beans that I wish tasted as good as the gallo pinto I enjoyed during the festival; the Nicaraguan doorman in my building listening to soccer matches on a radio during his shift. With all these gentle reminders, I felt compelled to offer some stray thoughts about my weeklong experience down in Nicaragua, in no particular order. 1. From the moment I landed at Managua's Augusto C. Sandino International Airport, I was treated like gold. In fact, all attendees were. Rather than be forced to endure the long country-entry lines, a Puro Sabor staffer greeted festival-goers at the gate, took our passports and $10 tourist card fees, then whisked us away to an airport lounge where bottled water and other refreshments awaited. While there were a few hiccups here and there, the white-glove treatment continued throughout the entire festival, and from what I could tell, things ran smoothly and people really enjoyed it. 2. Like everyone else at the festival, I started my week off in Granada. The city has changed a lot since I last visited, which was about a decade ago so that's not much of a shocker. Even back then, Granada was the most tourist-friendly municipality I visited, with many signs and menus written in English or having a translation. There were many businesses run by expats in the city, and today that number appears to have grown substantially, especially in the hotel and restaurant sectors. What I found fascinating, though, was the polish and modernity of some of the storefronts. While the colonial architecture of the building facades remain intact, many of the newer businesses clearly have been designed, planned and well thought out to the point that they could be moved to my neighborhood in Brooklyn and fit right in. 3. Speaking of restaurants, the best meal I had in Granada was at Kathy's Waffle House. I ate there with Jonathan Drew of Drew Estate on my last morning before moving on to Estelí, and the coffee was superb, as were my blueberry pancakes, bacon and mango smoothie. Was the perfect meal to cure a light hangover from the previous night's festival dinner at La Pólvora Fortress. Also, (pro tip) it's always good to have a big breakfast before a day of enjoying multiple cigars. 4. The dinner at La Pólvora Fortress was quite the affair. The 350-year-old fortress, which stored gunpowder before housing troops and prisoners, was taken over by Puro Sabor. The main dish was a hearty fare called fritanga, which included rice and beans, cheese, cream, chicken, meat, fried plantain, and salad. Plenty of Toña, the unofficial golden lager of Nicaragua, was served, along with many drams of Flor de Caña rum. Guests also received cigars from Liga Maestro, Joya de Nicaragua and Rocky Patel. 5. Like Granada, Estelí is also growing, albeit at a faster rate. It seemed everywhere I looked there was some sort of construction going on. The influence of the burgeoning Nicaraguan cigar industry on the local economy can be seen everywhere. The city now has a Pizza Hut and Burger King, and a slew of hotels have been built to accommodate the influx of visitors, with more being built. 6. Cigar factories are also expanding. Oliva Cigar Co. is adding on to their factory due to necessity, eventually boosting production to about 70,000 cigars per day. Padrón, too, is looking to add to one of its many warehouses in or around Estelí, as president Jorge Padrón was mulling over some blueprints during my visit there. And A.J. Fernandez also recently opened a new factory down the road from his original spot. 7. At Padrón, I also got the chance to see them planting seedlings in a field on the outskirts of Estelí. The word from industry vets at the festival was that, due to too much sun, the planting season for tobacco was pushed back by a couple weeks. What amazed me was how the near-black volcanic soil transformed from a crumbly ball of earth to proper dirt with just a tiny amount of water. 8. While other tobacco growers were cautious to plant due to the sun, A.J. Fernandez's fields seemed to be in full swing. While he had only recently begun planting in some of his fields, his shade-grown tobacco crops were nearly at shoulder level. He says he was able to start earlier with these crops because of the shade provided by the cheesecloth, plus his sophisticated irrigation system. 9. While touring Oliva, I learned that only one roller makes the Oliva Serie V Melanio Figurado, which was named 2014's Cigar of the Year. Her name is Juanita and she produces about 200 sticks per day, which is still an impressive amount given the intricate, double-tapered shape of the cigar and its intricate cap. 10. Perhaps the most awe-inspiring factory I visited was Plasencia Cigars S.A. After walking through the entrance, you're greeted by a serene courtyard with a large fountain in the middle, palm trees and other plants. To the left is the rolling gallery, with a series of windows overlooking the courtyard that allows natural sunlight to flow in. Most importantly, it was organized so that the factory could keep track of all the contract brands that Plasencia produces, which is 170 between his three factories. Not an easy task. 11. Plasencia also has added on to its factory, but in a different way. Before we started the tour, I smoked one of the new Alma Fuertes with Nestor Andrés Plasencia and his team, as well as Rafael Nodal of Boutique Blends Cigars, in a new, modern lounge that's been built in the office section of the grounds. The lounge features a fully stocked bar with stools, a couch and a few other seats, plus an espresso machine. 12. Another thing I noticed at Plasencia's factory is that the color sorting tables are black. Other factories I've seen have used white. Does it matter? No, as long as it's a consistent color. But it's something that stuck out. 13. I found out that Pete Johnson, owner of the Tatuaje and L'Atelier brands, is a proponent of veins and stems in a cigar. Pete was kind enough to give me a tour of the gorgeous My Father Cigars factory, and when we got to the stemming area, the conversation came up. Johnson noted that a consumer may find the veins and occasional stem in the filler to be ugly, but the fact is, the vascular system of the plant "is loaded with flavor." And at the end of the day, isn't that what matters most? 14. On my tour of Joya de Nicaragua with Juan Martínez, I got to see a little bit of the technology that he has helped bring into the company's factory. Rolling gallery workers don't clock in anymore. Instead, each worker stands in front of a machine that scans his or her face. A virtual punch card of sorts. He said it took about 14 months to perfect and went live shortly before the festival began. 15. During my tour, Juan pointed out a series of bricks at the far end of the factory that have patched up bullet marks from the fighting that took place in the area during the Nicaraguan Revolution. Looking at what Estelí is today, it's hard to imagine that not too long ago, there was lots of bloodshed in the area. 16. At Joya I also got to meet Panchita, an older woman who has been working for Joya de Nicaragua since she was 12 years old. She's worked in all sections of the factory, from bunching to rolling to grading and, now, quality control. She has a photographic memory, so if the factory ever has a question about something that may not be on file, they go to her.